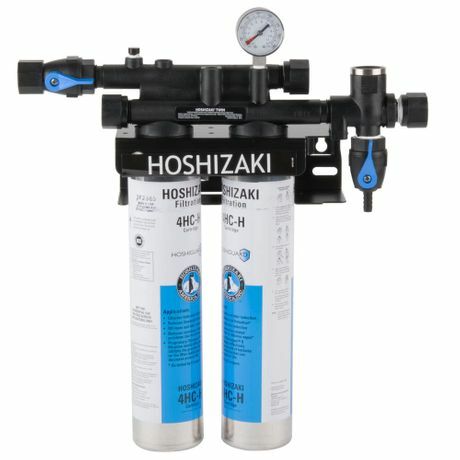 Superwater.com offers Free FedEx & UPS Ground Shipping On Every H9320-52 Hoshizaki 4HC-H Dual Water Filtration System # H932052 / Hoshizaki # EV9320-12 4HC Twin System Order. 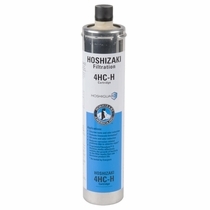 The Hoshizaki # H9320-52 4HC-H Dual Ice filtration system features Everpure's patented 1/2 micron precoat technology, and comes complete as shown, designed for icemaker feeders with self-contained scale inhibitor feed. Ideal for most cubers up to 1,000 lbs per day. NOTE: Not To be designed for use with most Flakers. Two quick-change HC Cartridges fit into Everpure's QC71 Twin head with water pressure gauge. Manifold features water shut off, flushing valve, and outlet pressure gauge.